The Turkish government seeks to continue dialogue with U.S. President Donald Trump's administration despite the unjust sanctions on two Turkish ministers due to a row over the imprisoned pastor Andrew Brunson. Foreign Minister Mevlüt Çavuşoğlu, speaking to reporters on Friday after meeting with his American counterpart in Singapore on the sidelines of the ASEAN summit, said that the two sides would seek further bilateral communication in resolving the issues. "There might be problems between our countries and there will also be dissidence. However, Turkey always wishes to resolve these issues via diplomacy, dialogue and mutual understanding," Çavuşoğlu told reporters after meeting his U.S. counterpart Mike Pompeo in Singapore. The relations between the two NATO allies deteriorated to an unprecedented extent earlier this week after the U.S. on Wednesday imposed sanctions on Interior Minister Süleyman Soylu and Justice Minister Abdulhamit Gül for not releasing American pastor Andrew Craig Brunson, who faces terrorism charges in Turkey. The Çavuşoğlu-Pompeo meeting came on the sidelines of the Association of Southeast Asian Nations (ASEAN) foreign ministers' meeting. 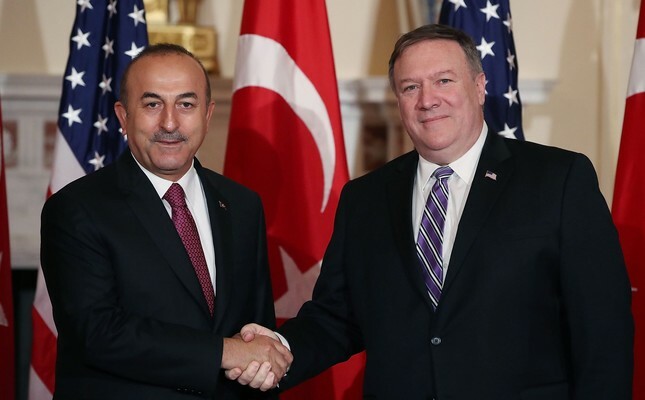 Çavuşoğlu called his meeting with Pompeo "constructive." He added both ministers had agreed to work in close cooperation and continue dialogue. "Since the beginning we have said that a solution cannot be reached by using threatening language and sanctions," the minister added. "They spoke about a number of issues, and had a constructive conversation. They agreed to continue to try to resolve the issues between our two countries," a statement attributed to State Department spokesperson Heather Nauert said on Friday. Regarding the U.S. move to impose sanctions on two Turkish ministers following tension over an American pastor, Treasury and Finance Minister Berat Albayrak also made a comment. Albayrak said problems may occur but relations should be maintained through diplomacy. Stating that Çavuşoğlu's meeting with his U.S. counterpart Pompeo in Singapore was positive, Albayrak said a strong will should be displayed to improve relations. Meanwhile, President Recep Tayyip Erdoğan told Donald Trump in a phone call last week when he was in South Africa that the United States' actions were not appropriate. "Everyone is hurt by such tensions. Not only we, but the U.S. would also be damaged." Following the announcement of the sanctions, Turkish political parties, the business sector and nongovernmental organizations have displayed a unified stance against the decision of the Trump administration. "We say 'no' to the U.S. threats with common solidarity and determination of our nation," said the Justice and Development Party (AK Party), the main opposition Republican People's Party (CHP), the Nationalist Movement Party (MHP) and the Good Party (İP) in a joint statement. The statement issued by the Treasury said Gül and Soylu were targeted due to their "leading roles in the organizations responsible for the arrest and detention of Pastor Andrew Brunson." The statement claimed these officials were responsible for "human rights abuses" carried out by Turkey - a key NATO ally of the U.S.
"As a result of these actions, any property, or interest in property, of both Turkey's Minister of Justice Abdülhamit Gül and Turkey's Minister of Interior Süleyman Soylu within U.S. jurisdiction is blocked, and U.S. persons are generally prohibited from engaging in transactions with them," the statement said. Çavuşoğlu said the ministers had discussed steps both countries could take to solve the existing problems. "Of course, it cannot be expected to solve all these crises or problems in one meeting," he added. The sanctions were issued under "Executive Order (E.O.) 13818, 'Blocking the Property of Persons Involved in Serious Human Rights Abuse or Corruption,' which builds upon Treasury's Global Magnitsky Act authorities," the statement added. The Global Magnitsky Act of 2016 enables the U.S. government to target entities that it claims participate in human rights violations or corruption anywhere in the world. The act allows for travel bans, seizure of U.S. assets and prohibitions on conducting business with U.S. entities.